Congratulations to Henry Cervantes, Larah Sanchez, and Rocket McKee. 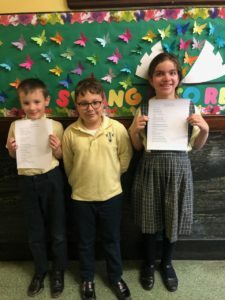 All three students will have original poems published in a poetry anthology series. This is the second publication for Henry! We are so proud of their efforts and accomplishments! I left until the dragons read silly stories! And suddenly I felt a jolt. It was big, I was tiny. I dreamed about a cookie planet, the most wonderful place a kid could be. There were multi colored candy birds and dandy candy bees. I climbed cookie dough mountains and saw chocolate rivers flow. How this planet came to be, I will never know. The houses were made of gingerbread, and the cars had oatmeal raisin wheels. When I saw all of these delicious things, I couldn’t control my squeals. I hope I dream this place again when I go to bed today.